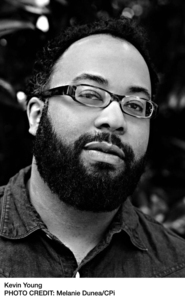 Purchase College-SUNY will present Kevin Young: A Reading and Conversation on Sept. 24, 2018 at 4:30 p.m. The program, which is free and open to the public, will take place at Purchase College in the Humanities Lecture Hall (735 Anderson Hill Road, Purchase, NY). Mr. Young has been named Purchase College’s 2018-19 Roy and Shirley Durst Distinguished Chair in Literature and will be featured in a series of events at the college. Kevin Young serves as director of the Schomburg Center for Research in Black Culture at the New York Public Library and as poetry editor of The New Yorker. As the author of 12 books of poetry and non-fiction, he has been a finalist for the National Book Award and the National Book Critics Circle Award. According to Monica Ferrell, associate professor of creative writing at Purchase College, “Kevin Young is a consummate intellectual with a relentless curiosity and a penchant for risk-taking, drawing inspiration from such varied sources as the history of earlier centuries (as in Ardency, a chronicle of the Amistad rebels);from the blues and other forms of music (as in Jelly Roll);and from contemporary artists, most notably Jean-Michel Basquiat (in To Repel Ghosts). “He is a man who won’t stand still, as the nearly-simultaneous publication of last fall’s Bunk: The Rise of Hoaxes, Humbug, Phonies, Post-Facts, and Fake News—a work of non-fiction that could not be more timely for our political moment—and Brown, a new collection of poems out this past spring, demonstrate. We are very lucky to have him serve as this year’s Durst Distinguished Chair in Literature at Purchase College,” she added. The Durst Distinguished Lecture Series and the Roy and Shirley Durst Distinguished Chair in Literature are funded by the Roy and Shirley Durst Distinguished Chair in Literature Endowment. The mission of the Durst programs is to infuse the experience and intellect of leading writers into the Purchase community while providing diverse opportunities for these writers to interact with students and influence campus life. As a small public college, Purchase is proud to introduce students to the level of expertise provided by the Durst Distinguished Lectures—outstanding opportunities for students and local community members alike to interact with accomplished authors. This season, in addition to a return visit by Kevin Young (Nov. 7), the series will feature short-story writer and essayist Carmen Maria Machado (Oct. 11) and novelist Dinaw Mengestu (Nov. 13). For more information, please visit: here or call 914.251.6550.